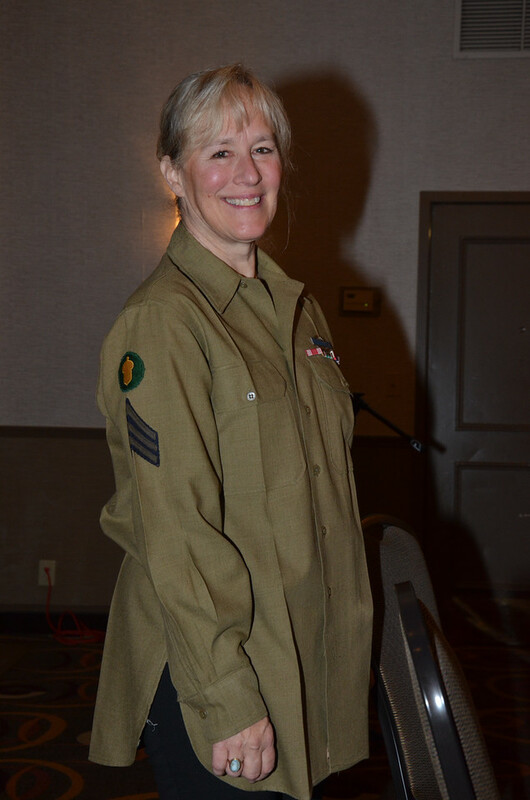 Karen in her father’s shirt at the 2015 reunion. “The Shirt” is a song written to honor veterans of the 87th Infantry Division at their 67th annual reunion, which was held in Warwick, RI in September 2016. The video below was recorded by Craig Stiegemeier, and begins with Karen Lilley explaining the story which inspired Nashville song-writer and performer, Ricky Ray, to put the story to music. The recording was made while Ricky Ray was travelling, as he wanted to make sure it arrived in time to be shared, so the acoustics are not superior. However, we have included the lyrics which you might want to read before you listen. We are told that Ricky Ray forwarded this recording to his friend, Willie Nelson, and that sometime he would like to re-record it. In the event that a new recording is released, we will keep you posted. We hope you enjoy this tribute to all veterans and to those who love them. Lyrics are posted below the video. LET’S HAVE PEACE ON EARTH!